The Facility Study Committee of El Dorado made a recommendation that the school board apply for a bond to build a new school. Due to the tremendous support of voters who were determined to provide the best educational facilities for their community, the bond won approval, and the new 72,425 sq. ft. Skelly Elementary School was underway. With four distinct areas, hundreds of feet of hallways, classroom spaces and extended learning areas, the commissioned architecture and design firms, PKHLS Architecture and DLR Group, needed to create a way to weave each space together, yet provide specific areas defined contrast. In order to create the most effective learning environments, the two firms also needed to take into consideration student safety, acoustic control, and ease of maintenance as their top design priorities. The two design firms developed a concept that used the floor to create color identities specific to grade level. 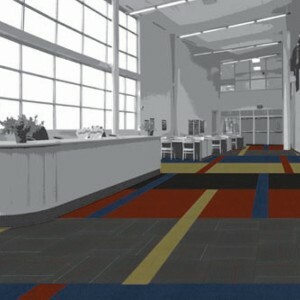 Four accent colors, combined with a common pattern of base colors, served as the theme that united the school while creating clearly defined areas. Common areas are accented with orange, while blue marks the Pre-K through first grade spaces, green marks the second and third-grade areas, and fourth and fifth-grade spaces utilize red. Linear products and patterns reinforce the primary North/South axis. The firms selected Invision modular carpet with a dynamic color palette to contribute to ease of maintenance over the building’s life cycle. Flooring Contractor – Commercial Floorworks, Inc.